A revolutionary product for a great price. Almost all computer-based musicians could do with this. You know, I can't help feeling that most computer-based musicians like the idea of owning a MIDI controller, but have stopped short of buying one for a couple of key reasons. For a start, there's the issue of cost - a MIDI controller won't actually make your music sound any better, and it's hard to put a value on the workﬂow beneﬁts you get from owning one. Then there's the compatibility concern - who wants to spend ages conﬁguring a piece of hardware when you could be using that time creatively? 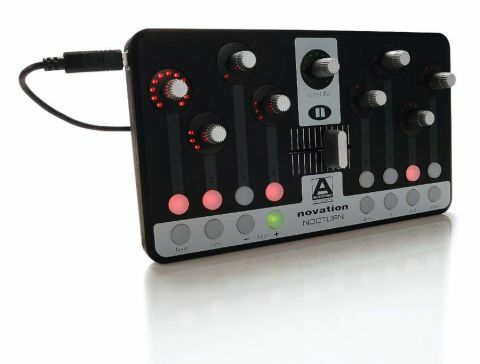 With the launch of their Automap-compatible range of ReMOTE controllers, Novation went some way towards solving the second of these problems but it still didn't really clear the pricing hurdle. With the Nocturn, however, the company have delivered a product that not only offers Automapping, but also has the potential to attract even the thriftiest of music technology customers. Billed as an 'intelligent plug-in controller', the Nocturn is a compact, desktop-friendly device that features eight assignable touch-sensitive rotary encoders. These are of the 'inﬁnite' variety - so there are no start and end points - and each is surrounded by a ring of red LEDs so that you can see its current position. Further assignable controls include a crossfader and eight numbered buttons, all of which are backlit with a red LED. A row of eight further buttons sits below these (these are all backlit with green LEDs) but, because they're used to control some of the Nocturn's functionality and view particular control groups, they can't be assigned. One ﬁnal control that's 'locked' is the centrally positioned Speed Dial. Handily, this takes control of whatever your mouse is currently hovering over. Like the encoders that surround it, it's touch-sensitive and inﬁnite, though it differs from the other dials by being notched rather than smooth and having secondary functionality when pushed down. It's worth noting that use of the Speed Dial isn't just restricted to your music software - it will work in any application. Despite being made of plastic, the Nocturn feels reasonably durable, and looks-wise it's streets ahead of the majority of MIDI controllers, budget or otherwise. It has just one connection, a USB port, and because this is located on the top left-hand corner, you can position the Nocturn ﬂush up against something else on your desk rather than having to leave a USB cable-sized gap behind it. application in question is the second version of Novation's Automap Universal software. This is also compatible with the ReMOTE SL controllers I mentioned earlier, but it's clear that the release of the Nocturn is what's inspired it. Getting the Nocturn up and running is easy. The ﬁrst step is to run the Automap Universal 2.0 installer, during which the Plug-in Manager will open. This scans your plug-in collection and displays a list of them - all you have to do is drag the ones that you want to be Automap-enabled (ie, the ones you want to be controlled by Nocturn) into a window on the right. These additional plug-ins are then available for use within your DAW, showing up below the originals in your folders of instruments and effects. The interfaces are unchanged apart from the addition of an Automap border. When you boot your host, the Automap software automatically ﬁres up as well and, by default, it sits on top of your main music-making software. Although this might sound odd, it actually works really well - you can adjust the transparency of the interface and resize the window to ﬁt your requirements so you can be quite happy that it's not in the way. A tap of the Nocturn's View button, meanwhile, can make it disappear completely. Load an Automap-enabled plug-in and the genius of Nocturn quickly becomes clear. A glance at the Universal software reveals that its parameters have indeed been pre-mapped and are ready for tweaking. If these are greater in number than the Nocturn's hardware controls, extra pages are created, and these can be quickly accessed using the Page+ and Page- buttons on the hardware. Predictably, Automap doesn't always get the assignments spot on - in some cases, I found that parameters that should have been put onto encoders were assigned to buttons - but thanks to an intuitive Learn mode, making adjustments is easy. To change a single control, you just have to press the Learn button, move the desired parameter in the software then touch the appropriate encoder or press the correct button. Pressing the Learn button twice, meanwhile, enables you to map multiple controls. And that's it - job done. You can then set a new default map for the plug-in or save the changes with your DAW project. Switching between plug-ins (or any other 'Clients', to use Automap parlance) is easy too. Just press one of the browser buttons on the Nocturn (User, Fx, Inst and Mixer) then touch the encoder or button that corresponds to the one you want to take control of. Given that the whole idea of a MIDI controller is to take the focus away from your computer and put it back under your ﬁngers, Nocturn's software-centric approach might seem strange. The fact is, though, that it works remarkably well. Looking at your monitor when you're scanning for assignments quickly becomes second nature, and in some ways is actually easier than dealing with tiny LCD displays. And that's Nocturn all over - easy. While some hardware manufacturers seem to have released MIDI controllers just because everyone else is doing it, Novation have thought about what musicians really need and designed a surface that makes perfect sense. If you have a stack of plug-ins that you want to take hands-on control of, there is no more elegant, accessible or affordable solution.